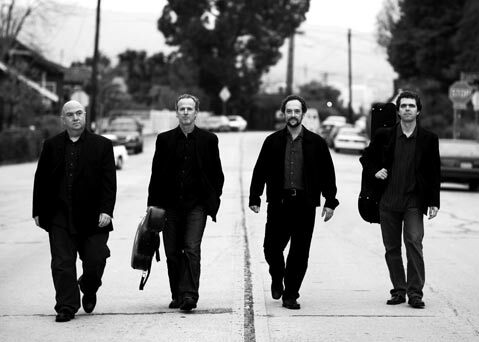 FRINGE PRODUCT: Later this month, the Santa Barbara Symphony presents a citywide International Guitar Festival, a grand tradition begun two years ago and bigger and better the second time around. Included in this edition, from March 21-29, will be the L.A. Guitar Quartet (LAGQ), giving a West Coast premiere of a new Sergio Assad concerto, jazz great Russell Malone at the Lobero (with Ron Carter), Wings man Laurence Juber at SOhO, and Leo Kottke at the Luke. On other nights John Cleese joins the LAGQ at the Lobero, and the acclaimed Brasil Guitar Duo play Hahn Hall. Guitar-the serious stuff-will be the thing for a week (thesymphony.org). For the guitar-curious, one of the more enthralling recent recordings is masterful guitarist David Russell‘s For David (Telarc), a too-rare high-profile offering of new music for classical guitar. Of the list of composers-also including Francis Kleynjans, Stephen Goss, Benjamin Verdery, and Philip Rosheger-Assad is the best-known. His engaging 1986 piece Aquarelle kicks off a set of accessible but also adventurous pieces written for Russell, who earned bragging rights by topping the classical charts with last year’s luminous Air on a G String. Classical guitar remains largely grounded in the sound and spirit of Spanish composers, and French composer Kyenjan bows in the direction of the late guitar-friendly guitarist-composer Francisco Tarrega with Arabesque en Forme de Caprice (sur le Tombeau de Tarrega), a lovely and lyrical piece, played accordingly. From a more venturesome angle, Verdery’s Now and Ever heeds the hypnotic minor second interval, moving in a slaloming motion between tonal and atonal areas, though never lapsing into pure abstraction. The album ends with sweet-yet-contemporary-flavored miniatures by American composer Rosheger, “Waltz No. 7,” “Lullaby to Wake Up To,” and “Good Luck Waltz,” in which the classical guitar’s unique blend of intimacy, nostalgia and modernity converge beautifully. TO-DOINGS: For many moons, saxophonist, left-field jazz deejay (on KCSB), and intrepid gigmaker Colter Frazier has been keeping the new musical faith, tending to the bimonthly Santa Barbara New Music Series at Muddy Waters. Most often, Frazier books outta’ towners (mostly from the more experimental fringes of Los Angeles) and he opens the evening, improvisation-wise. This week, on Friday rather than the usual Thursday, Frazier’s own quartet assumes the headliner spot, celebrating the band’s fine and free-spirited eponymous CD, released on the Ventura-based pfMENTUM label late last year. In the intriguingly different instrumentation of this tight, “chordless” band are Frazier on tenor sax, Nick Coventry on viola and violin, bassist Miles Jay, and drummer Matt Crane (replacing Frazier’s old cohort Rob Wallace, who has relocated to Guelph, Ontario, for continued schooling). Coventry does double duty this night, as part of the opening act-the crazy good progressive-folk-something band Oso. As heard on the disc, Frazier’s tunes traverse neatly scored parts and plenteous margin for in-the-moment improv from his freedom-suited band. He pays respects to musical influences, including Charles Lloyd on “Lloyd’s Prayer,” and post-M-BASE saxist/thinktanker Greg Osby on “Lunch with Osby.” Variations in mood and manner, from the driving percolations of “Hopes of Reunification” to the cool, loopy ruminations of “Focus” to the antic free play of the deceptively-titled “August Ballad,” give the album an alluringly variegated wholeness. Frazier is onto something, a contemporary jazz sensibility that can be serious, elastic, and open-hearted, by turns. BACH ALERT(S): In honor of Bach’s b-day (March 31), a Bach Birthday Bash takes place at Trinity Episcopal Church on Sunday at 3:30 p.m. But the big Bach news-and a highlight of the classical music season-is next Wednesday’s arrival of the great Academy of Ancient Music, to the tune of Bach’s Brandenburg Concertos, revised and restored, on a Harmonia Mundi recording and now on tour, stopping at the Granada. Via director Richard Egarr‘s stripping down the normally overly orchestrated scores, pitching down to Baroque era tuning, and with the group’s customary period instruments, this great music sounds somehow fresh and reinvigorated. Check it out.